KDE is a highly diverse community and every one of our contributors has his or her own motives, such as having fun, developing new skills and meeting nice people. 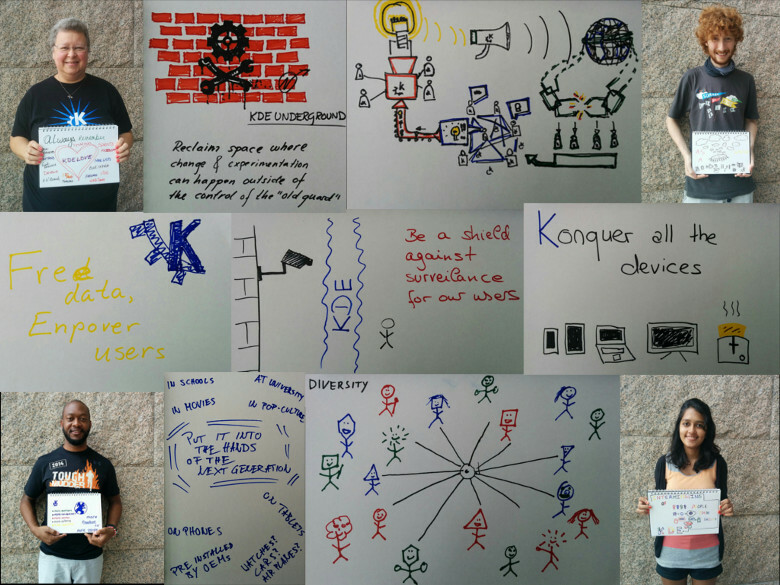 However, a common desire unites all of KDE: to change the world for the better. This shared motivation, although the major driving force behind KDE, has never really been made explicit. A world: We are not doing this only for ourselves, our friends and family, our employer or customers, and we recognize no geographical barriers to our work. We want to change no less than the world we live in. Everyone: The work should not just be for a small group of people. The fruits of our work should be available to all, without being restricted to materially, educationally or socially privileged people. Control: KDE has always aimed to put people in control. We don't want to hand over control to anybody else. Not to some service providers, not to some hardware vendors, not to governments, not even to KDE. KDE wants to put you in the driver's seat. Digital life: We want to allow people to control every aspect of their digital lives: Hardware, software, data, communication, everything. Of course, there is much more to life than the 'digital' part. While we all want freedom and control in the other parts too, influencing that is beyond KDE's scope, so we limit our vision to "digital life". Freedom: We believe that freedom is a prerequisite to true control. Some may feel in control of a proprietary application as long as it obeys their commands, but without the freedom to make changes and share them, they are entirely reliant on the vendor's benevolence for this apparent 'control'. Privacy: In a world where our privacy is increasingly threatened, we wanted to emphasize its importance. Freedom without the right to privacy is no freedom at all. Our vision unites KDE in common purpose. It sets out where we want to get to, but it provides no guidance on how we should get there. After finalizing our vision (the "what"), we have immediately started the process of defining KDE's Mission Statement (the "how"). As with all things KDE, you are invited to contribute. You can easily add your thoughts on our mission brainstorming wiki page. If you share our vision you can also support us by helping to fund our work, either via a regular payment as an official Supporting Member or via a one-off donation. I also would be prefer to see some improvements in kind of accessibility for visual impaired blind people or people with other disablitys. Sadly KDE is mostly inaccessible. Keep on your gread work :). Hi Simon, yes, I think KDE can do better. For now, we're working upstream in Qt to make the tools for a11y better everywhere. You are welcome to join us in IRC, #kde-accessibility, or on the KDE Forum, or the mail list: https://mail.kde.org/mailman/listinfo/kde-accessibility . We need testers as well as coders! This is an exciting vision! People only have that freedom if they have the skills to actually, really modify their software. We should help to educate people so that they have the coding skills. We should encourage them to participate in our community, so that they feel empowered to use their skills to help others. And we must simplify the practical steps to find source code, modify it, build it, and install the modified app locally. Tinkering should be as easy as we can possibly make it. Imagine a Web Inspector, but for all KDE software—imagine if you could edit KDE software as easily as a web page! You just described oss software. Hi Adina, we've not forgotten the disable. But I think KDE can do better. For now, we're working upstream in Qt to make the tools for a11y better everywhere. Please join us in IRC, #kde-accessibility, or on the KDE Forum, or the mail list: https://mail.kde.org/mailman/listinfo/kde-accessibility . We need testers as well as coders! Privacy without security doesn't exist, please add that to your list. I am curious for the mission, but most interesting will be how you translate this into your strategy going forward. I think that KDE will have to choose its battles, so I am looking forward to better understand your priorities (and 3-year plan). A nice concrete vision! Love it.